On 26 May 1983, I was sitting in my ninth grade class when my science teacher and birding mentor pulled me out of class. We went outside and he showed me a Mountain Quail that he had discovered under the foundation plantings at the school. 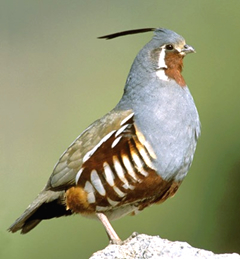 I'm a bit embarrassed to say that this is still the only Mountain Quail I have ever seen! Which leads me to wonder, should life birds expire at some point? Since it has been almost 30 years since I saw this bird, what does it mean for me to have it on my list? Surely I can't say that I really know this bird. Since I moved away from Oregon after high school, and am only back to the West Coast for infrequent visits, I've got several other long-lost lifers from that era on my list. Mountain Quail is my oldest long-lost lifer, but I've got a couple others from the early 1980s, including Short-tailed Shearwater from my first pelagic trip in 1983, White-headed Woodpecker and South Polar Skua from 1984. In reviewing my ABA list, there are at least 10 birds on there that I've only seen once, back in the 1980s! In the 1990s, I was chasing more ABA rarities--so perhaps I can be forgiven for only ever seeing one Black-tailed Gull (VA, 1995) and Siberian Accentor (ID, 1997), but a full review of my ABA list shows 19 birds on there that I only ever saw once, back in the 1990s. A few of them aren't even all that rare! There are many other birds that I've only seen a few times. I hesitate to even count up how many species I haven't seen for the past ten years (but now that I think about it, I'm going to have to do it!). But what do you think? How long can you keep a bird on your list without seeing it again before you should remove it? Back in Y2K some people decided to start over with their lifelist, and started keeping a new Millenium List. I'm not sure I'm ready to do that (he says, clinging to the memory of that Mountain Quail!). But what about you, do you have any embarrassing long-lost lifers, birds you are embarrassed to admit you've only seen once a long time ago? Hmmm interesting question Birdchaser Rob. I guess I haven't been birding for very long but I've got plenty of 'Lifers' I've only seen once and may never see again. Still, I remember them pretty well, so there's the impression and the notation. That being said, I can sympathize with that wistful feeling of the one-and-done lifer experience. I've only been at it about ten years, but they are called "lifers." What about the birding trips to other regions? Pelagics? Vagrant species? You see them, you ID them, you might learn a little something about their behavior, habitat, and range. I don't think you need to exchange Christmas cards in order to keep an old (to very old) lifer on your list. The fact you so clearly remember the "get" is plenty of evidence it was a memorable bird. It's those Audubon-walk new species seen 200 yards away through someone's scope that make me waffle. Good subject, thanks. Any bird you've seen, even just once, should certainly remain on your life list. I've got several birds on my life list that have only been seen once that I don't really know well, but I know that I saw them. I did purge several birds from my life list a couple years ago from my very early days of birding as I am certain I misidentified the birds. I still am after soul-satisfying-views (SSV's) of many birds seen only once or twice in the past and I hope to photograph all the birds I can. A point that came up over at the ABA Facebook page discussion of this post: eBird is awesome for keeping track of your lists, and is a lot of fun to play with because it can easily show you how many times you've seen each bird (as long as you have your sightings entered in). That's another incentive to go back and dig up your old bird sightings--it's very soul-satisfying to see all your bird sightings listed like that--though it is still rough to see how few times I've seen some species! It's an interesting phenomenon how most of the birds one sees near the start of one's bird career one is likely to see many more times. But the exceptions are fascinating. I started birding Delaware and the Mid-Atlantic when White-winged Tern was pretty much annual, sometimes with more than one individual present. That sure dried up. BTW, I've only seen Mountain Quail twice. But here's a side issue that fascinates me. Robert says above, "Any bird you've seen, even just once, should certainly remain on your life list." I don't dispute that many will hold that to be true and I think one of the things that makes birding great is that the individual birder gets to make so many final decisions him or herself. But I sometimes wonder if another model might be just as applicable if not as popular. Let me say before I go on that these ideas are heavily influenced by my many years as a bird tour leader, which certainly gives one a different perspective, in some respects, than most birders have. To try to cut to the chase, I've spent a lot of time with birders who are getting their only look at a given species. In many cases quick looks at hard to distinguish species that rush by while group is focussed on more spectacular or cooperative ones. Also, many of those birders are older, even elderly. Now, many would say that a bird you've seen is a bell that can't be unrung. But I wonder if one's life list, to some extent rises and falls as one goes on. This is an easy concept to grasp if you're talking about athletic performance. An athlete's performance improves, reaches an apex at some point, then declines from there on out. So there's a high water mark even if the person can't currently repeat the performance. Now, I am in the position of having seen thousands of species of birds but not having kept careful lists of all of them. Some of those are old friends; I know them well and have a sort of ongoing relationship with them. Others, I've seen briefly and not even all that well, but those quick encounters are etched in my memory. Green-and-Rufous Kingfisher falls into that category for me. Now, that whole span of birds, from the firm to the fleeting, I have no problem counting. Where I have more trouble is in cases like some of the greenbuls or cisticolas in Africa where, sure, I saw 'em, but I really feel I have no relationship to that species. I can't recall details about them. If I were to see them again, I'd be starting from scratch. I have a hard time counting these birds. My impression is that most tour participants do not, and that's fine. If it's on their list, it's on their list. There's another problem for my more qualitative approach: age. Like it or not, some things slip away from us. I've seen older listers unable to recall even quite common birds they've seen many times. Now, they in many cases can go to a recorded list and say, yes, I've seen that bird. But even that ability to manage lists can corrode over time. I wonder if it's more accurate in some senses to say that, like the athlete who at one point could run a 4 minute mile but can no longer come close to that mark, that one's lifelist peaked at around 3000 or whatever, but now may only number in the hundreds. I realize that this may sound grim and odd and fundamentally unsatisfying to some. But I feel pretty sanguine about it. I expect as I age I'll gradually remove species from my "core" list that I just can't recall. Now, maybe I'll get more organized and start to curate records of bird encounters that are entirely gone otherwise, like fossils where minerals have replaced the bones that were once there but have long since vanished. But I don't know. Anyhow, I loved Rob bringing up this topic and pointing out how special some of those one time encounters are. I'm originally from Idaho, but I've been living (and birding) in Colorado for the past year and a half. Colorado has a larger state list than Idaho, so now that I'm getting ready to move back to Idaho, I keep asking myself whether I get more enjoyment out of the once-or-twice-a-year eastern rarities that I get to chase here, or the everyday abundance of more common species I experienced in southwest Idaho. I've decided that at least for me, rarities that you only see once or twice may provide some of the highest highs out on the birding trail, but you can't beat the everyday pleasure that comes from some of the more common species.